Hog Farming. We have been at it a long time – more than 35 years. Plenty of ups and downs with changes abound. Pigs are born. Pigs get sick. Sometimes they get better and sometimes they die. Prices go up and prices go down. But even after 35 years, there isn’t anything we would change. Yes, hog farming is just plain hard some days. It’s especially hard when certain groups of people purposely misrepresent what we, as hog farmers, do. Recently, a video was released by HSUS (Humane Society of the United States) depicting acceptable animal care procedures as “animal cruelty.” They use extensive video editing, which results in a “Hollywood theatrical” production. They try to show farmers as cruel and heartless, something most Americans know is not true. Hog farmers have been hit recently by a new virus never seen before in the U.S. It is called PEDv (porcine epidemic diarrhea virus). 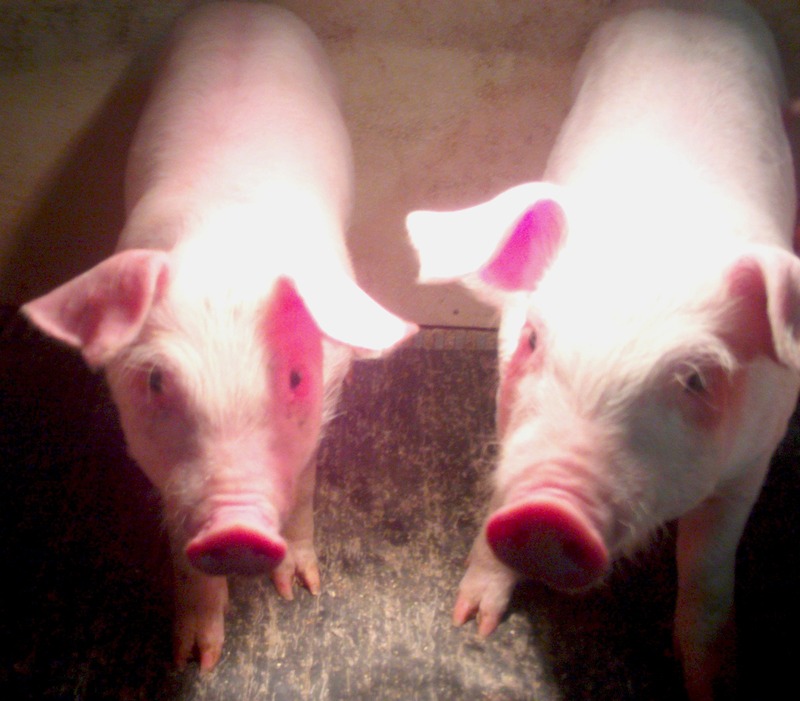 This virus is nearly 100% deadly in baby piglets under the age of 3 weeks. The U.S. has lost millions of baby piglets since April, 2013 when the virus was first detected. The virus does not affect the food we eat or human safety. Heart wrenching is the only word that comes close to describing what farmers feel when they learn the virus has infected their farm. It spreads very easily and there is nothing you can do to stop it. AND, there is no vaccine. Because there is no vaccine, farmers need to expose the sows to the virus so they can start developing their own natural immunity, which is then will be passed onto their baby piglets. The way that is done is by letting the sows ingest the virus, which is in dead piglet intestines. Infected piglet intestines are fed to sows as a natural immunization method (this process is called feedback). No, it’s not a pretty sight, but this is something that has been done for years if there is no vaccine available. Researchers and scientists are working feverishly on developing a vaccine. Until then, farmers’ only choice is to work with nature to provide that immunity to their animals. It’s all about saving pigs. But animal rights groups want you to think this is cruel. Hog farming is just plain hard. Another part of the video talks about pigs going insane, all while showing a pig biting at the pen bars. What you don’t know is this pig is very curious about the person standing in front of him with a camera. The pig is just checking him out. Then you hear the background sounds of squealing pigs with no pictures, only allowing your imagination to run. There are many reasons a pig squeals. The most common reason they squeal is when it’s time to eat. Very normal. Hog farming is just plain hard. I think back at times when I, as a parent, had to do some really hard things with my children. I remember the first time taking my baby daughter to the doctor’s office to receive her first immunization shot. I remember hearing her scream at the top of her lungs from the pain. I cried. Yes, that’s hard. Or the time, when my daughter needed tubes in her ears at the age of 3. I still remember the nurses taking her away to the operating room. I cried. Or when my youngest daughter had jaundice and I had to leave her in the hospital for two nights so she could stay under the lights. I cried as I left her. I am sure a dark, grim video (enhanced with disturbing music) with snippets of these baby experiences could be produced and would rival what this video shows. It would surely indict me as a cruel mother. Yes, parenting is just plain hard, too. Much like hog farming. And, yes, we have cried over our pigs during hard times. So why do these groups put the money, time and effort into creating these videos? Very simple. It’s to tug at people’s heartstrings so they will donate more money to their organization(s). Yes, sad as it is, it’s all about the money. HSUS has a $150 million yearly budget and yet, less than 1% of their money goes to local animal shelters, the very place where most people think their money is helping. And it’s sad because family farmers, who are caring and dedicated, are the victims of their smear campaigns. Hog farming is just plain hard. America’s family farmers are repeatedly attacked by animal rights groups. Recently, RollingStone published an article, “Animal Cruelty is the Price we Pay for Cheap Meat.” Again, the video was a theatrical production aimed relentlessly at farmers, with their ultimate goal of eliminating animal agriculture and, perhaps most important, people’s donations to their organization. Here is my reaction to the Video. The only way we can stop these organizations is to stop the money inflow. If we stop the money, their organizations will diminish. Yes, hog farming is just plain hard. Thanks for sharing the truth about feedback. This is a wonderfully written explanation of the process pig farmers use to help save piglets. It’s not an easy or pleasant thing to do, but it’s done to stop the spread of the disease in that herd and prevent more animals from sickness. It’s one more example of animal care being top priority for farmers. Thanks Peggy! Feedback isn’t something hog farmers use all the time, but when you have virus such as PED, you really have no choice. It’s all about saving pigs and that’s why we are hog farmers. Thanks for sharing your story. It’s amazing how these activist groups and even the “W5” videos can be edited to the extreme for the biggest fear factor! If these groups keep attacking agriculture they are going to dramatically change the industry in which they know nothing about. Very sad. Thanks Sarah! It just amazes me that groups like HSUS vilify farmers for trying to save pigs. Hoping people can see through these videos and see who HSUS really is – a PR donation ($) machine. Trying to “save pigs” — so you can slaughter them when they’re fat and ready. Are we supposed to feel sorry for you after reading this? You’re trying to save your profits, not the pigs. Let’s just call it like it is. Farming is unique. Yes, we need to make profits so we can put food on our table. I will not apologize for that. At the same time, we as farmers are compassionate about our livestock. Saving and having healthy pigs is what we work at everyday.